BaBylissPRO Tourmaline Titanium Travel Dryer. 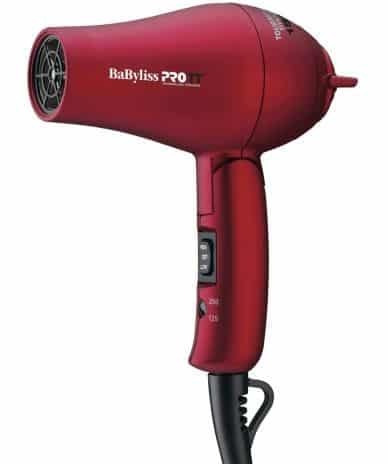 The BaBylissPRO Tourmaline Mini Folding Travel 1000 Watt hair dryer is a light weight and inexpensive for grooming. It can be easily tucked into a suitcase or travel bag for use anywhere there is dependable electrical power. The unit is dependable as well as fast and effective in attaining the desired hair style results. In a description of the device, the usual components are well explained. The materials used in the grill have an ionic result, so the hairs never end up as a frizzy halo. The negative ions are helpful to smooth the strands and avoid damaging the cuticle, as other more expensive products may do. The wattage is set at 1000, so the unit packs a lot of power for the size, This means the hair dries more quickly. This particular model comes in an attractive red color. A major benefit is the fact that this tool is very light weight. The shipping weight is only one pound, so holding and styling with the unit is not hard. Heavier tools may ever take longer to complete the style efforts, so the Babyliss product comes out ahead in that area as well. Some users are surprised at the small size of the unit. The handle folds down so that it takes a minute amount of space in a suitcase, travel bag, or even brief case. There are two heat/speed settings. The unit can be set on high or no heat. In addition, the user can pick a low or high speed, so there is no reason to spend a lot of extra time in grooming. The switch is easily accessible and can be operated with the touch of a thumb. The dual voltage settings make this a unit that you can easily take to Europe or elsewhere in the world where 125 voltage is not the typical power source. You can choose from 125 or 220 volts. However, it should be noted that a plug adapter is needed for USA to Europe or other parts of the world. This is because the outlets are structured differently in other venues. As with any device, there are a few disadvantages that have been noted. Some feel that stating that the unit has two setting for heat is incorrect. In fact, the dual settings are for speed. There is no cool shot setting however. The unit works so well that you can use it not only for traveling, but as a home grooming tool, as well. The titanium plates are well known for their ability to smooth and style the hair without the need for high heat. Because the process doesn’t damage the hair cuticle, there is a no frizz component to the final results. The positive reports from those who have purchased the BaByliss Tourmaline Mini Folding Travel 1000 Watt Hair Dryer are an indication that there are major advantages to the operation of the tool. The advantages include: Tourmaline Titanium technology, foldable handle, dual voltage, removable filter cover with stand, lightweight, 1000 watts, and limited 12-month warranty.